The Galápagos Islands, also known as the Islas Encantadas, lie approximately 1000 km (600 mi) west of Ecuador, straddling the equator. The archipelago consists of 13 major islands, 6 small islands, and scores of islets and rocks, with a total land area of 7882 sq km. As suggested in the drawing, the islands are of volcanic origin. In fact, the westernmost major island, Fernandina, and the largest island, Isabela, are sites of frequent eruptive activity. The major islands are shield volcanoes, immense piles of basaltic lava flows built up off the sea floor. Shield volcanoes ideally have a very broad, gently convex upwards profile, such as a Viking's shield laid flat on the ground might exhibit. 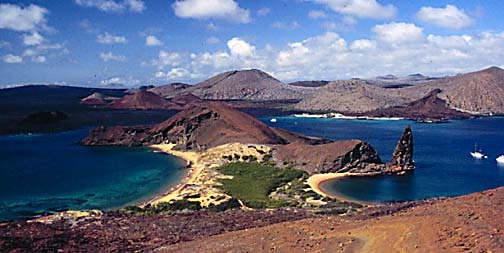 Santa Cruz island, in the background, shows the classic shield volcano profile. The island of Fernandina shows a variation on this profile, where the volcano, historically the most active, has built up a somewhat steeper-sided pile in the middle of the otherwise low-profile island. 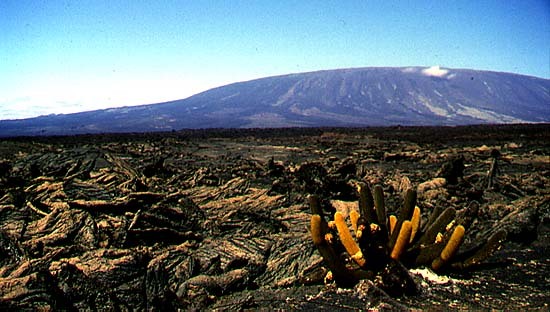 The cactus in the foreground belongs to the genus Brachycereus; this cactus is one of the early colonizers of new lava terranes. 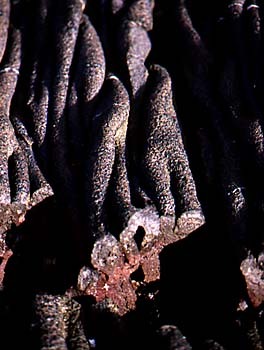 Sometimes the cactus is engulfed by later flows, as shown by molds of Brachycereus preserved in some flows. 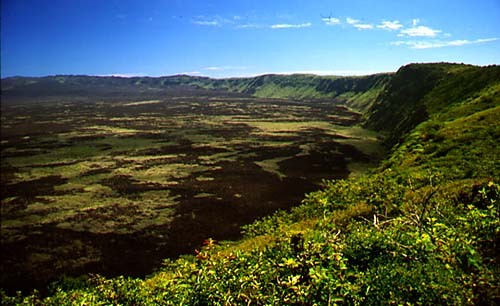 Many of the giant shield volcanoes feature an impressive caldera at their summits. The largest is the caldera of Volcán Sierra Negra. 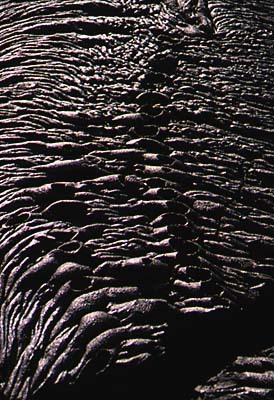 This immense oval depression is about 10 km long, and floored with lava flows. Calderas differ from ordinary volcanic craters in that they are not merely the vent through which volcanic products issue. Calderas result from collapse of the surface of the volcano caused by the withdrawal of vertical support when large scale eruptions take place. Not all eruptions take place from summit vents. 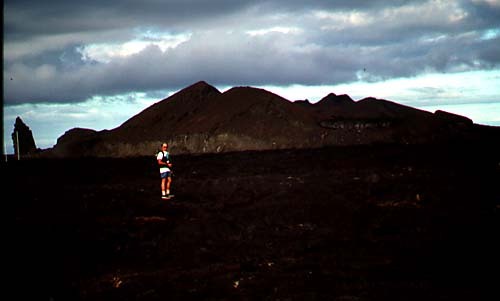 Flank eruptions may occur, especially in larger volcanoes where the pressure needed to raise the magma to the summit may exceed that needed to cause it to burst through lower on the flank of the pile. 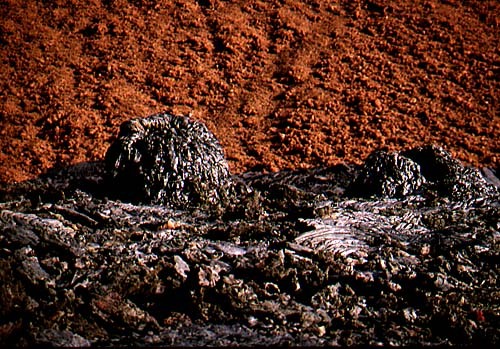 The main volcanic pile of Fernandina is dotted with little parasitic cones showing where flank eruptions have occurred. 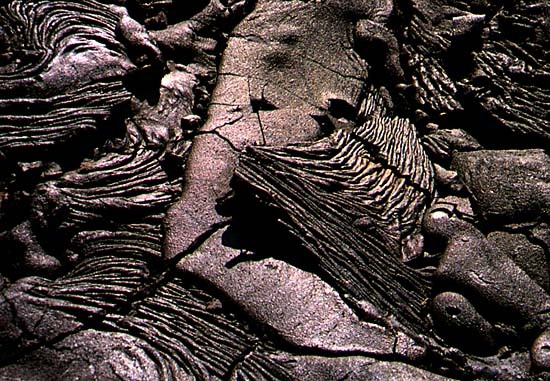 These shield volcanoes are produced at thermal features known to geologists as "hot spots". Hot spots are areas on the earth's surface characterized by unusually high heat flow, commonly manifested in volcanic activity. The hot spots are believed to overlie mantle plumes, slowly rising columns, perhaps 150 km in diameter, of hot, viscous mantle material. The rising mantle plumes spread out radially beneath the tectonic plates, heating the overlying lithosphere. Volcanoes may form on the surface of the overlying lithospheric plate, only to be carried away from the heat source by plate movement. For an in-depth discussion of the concept of hot spots and mantle plumes, see Morgan (1972). 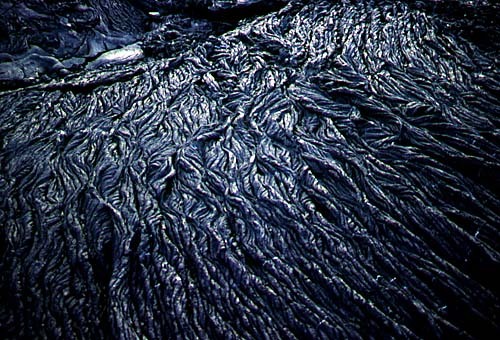 The Hawaiian Islands are the classic example of a linear string of shield volcanoes formed at a hot spot over a mantle plume; the young, active volcanoes are at the southeast end of the Hawaiian volcanic chain, with inactive and increasingly older and more eroded volcanoes strung out to the northwest from the hot spot. Similarly, the Galápagos Islands are shield volcanoes formed over a hot spot, with the youngest and most active volcanoes at the west end of the chain. Plate movement is to the east-southeast, on a bearing of 102 degrees (Hey, et al., 1977). 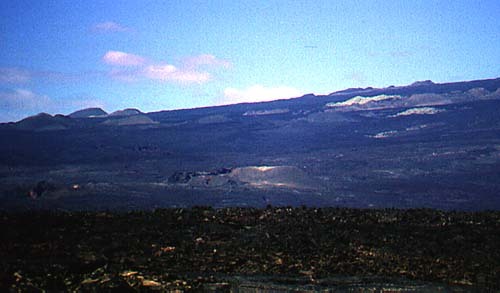 Volcanic activity in the Galápagos generally diminishes eastward from Isabela; however activity has been more widespread and less linear than in the case of the Hawaiian Islands hot spot chain. Eruptions have occurred in historic times on Santiago, Marchena, Pinta and Santa María. 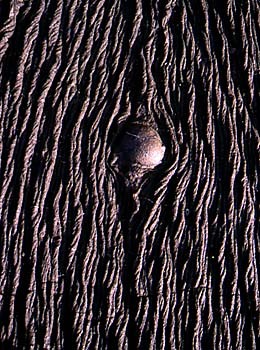 Although parts of the Santa Cruz shield are more than a million years old, it is still considered an active volcano. Even San Cristóbal, at two and a half million years old and the easternmost of the major islands, is considered still active. 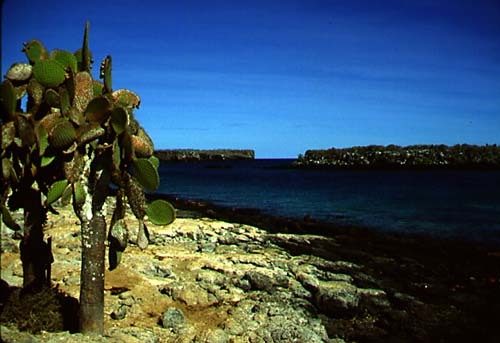 But Española, the southeasternmost island is extinct and eroded. When a volcano becomes extinct, the forces of erosion take over and the cone is eventually destroyed. At Punta Suárez, on Española, the wave-eroded cliffs reveal stacked lava flows that make up the internal structure of a shield volcano. The white color is due to the droppings of countless sea birds; Punta Suárez is a world class sea bird rookery, with waved albatrosses, swallow-tailed gulls, and thousands of blue-footed and masked boobies. Behind the cliffs the surface rises in the gentle slopes typical of a shield volcano. 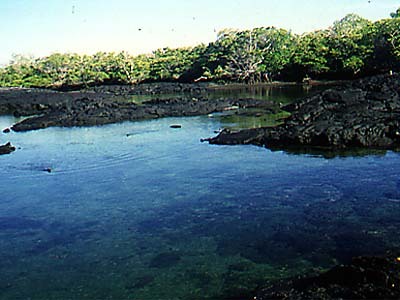 Underwater to the east of the Galápagos archipelago lies the Carnegie Ridge, also a product of the Galápagos hot spot. This volcanic ridge is dotted with sea mounts, one of which has been dated at eight million years old. This sea mount shows evidence of having once been a volcanic island, now sunk to a depth of 1500 m as plate movement has carried it away from the uplifted area of the hot spot proper. The Galápagos hot spot lies, at present, just south of the crest of the Cocos-Nazca spreading ridge, and there is good reason to believe that sea-floor spreading has had a significant effect on the formation of the archipelago. 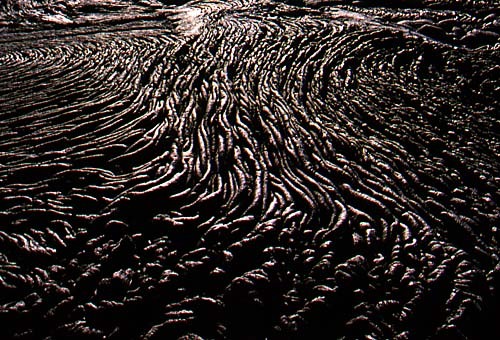 The complex relationship between the Galápagos hot spot and sea-floor spreading at the Cocos-Nazca ridge is described by Hey (1977) and Hey et al. (1977). A pattern of normal faults can be seen in this air view of North Seymour and Baltra islands. 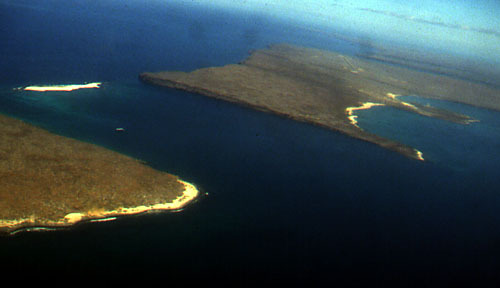 North Seymour (left) is separated by a straight, fault-bounded channel from Baltra Island (right) where the main airport lies. 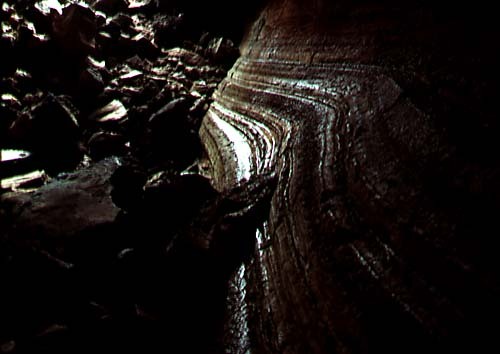 Baltra itself is cut by several faults, and the Baltra harbor results from down-dropping of one of these fault blocks. Another channel, probably also fault-bounded, separates Baltra from the larger island of Santa Cruz. 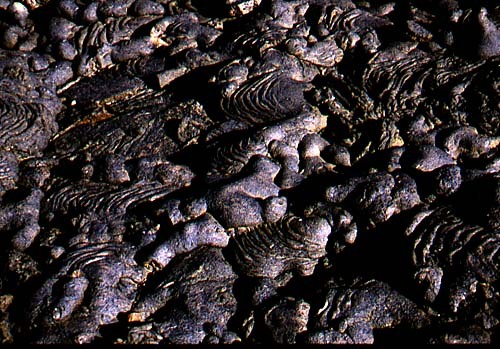 These normal faults trend roughly east-west, generally parallel to the Cocos-Nazca spreading ridge to the north, and may be the result of regional north-south stretching related to sea-floor spreading. Alternatively, they possibly result from more localized doming and stretching of the surface of the Santa Cruz shield volcano. 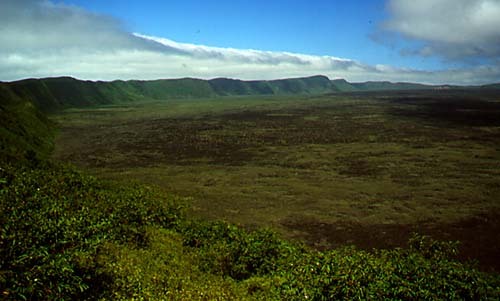 In addition to the large shield volcanoes, the Galápagos islands feature nearly countless smaller cones and volcanic structures, such as these dotting Santiago Island in this famous view from the small cone that forms Bartolomé Island. 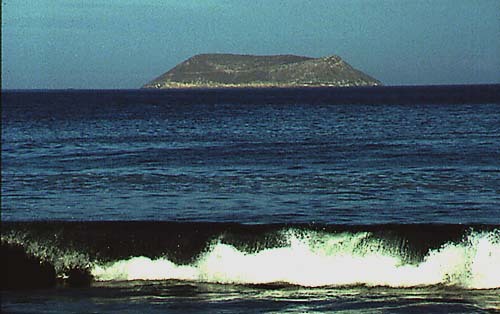 Sombrero Chino (Spanish, "Chinese Hat") is a small island formed by a single extinct cone, as is the smaller Daphne Major, whose crater floor is the nesting ground for a colony of blue-footed boobies. 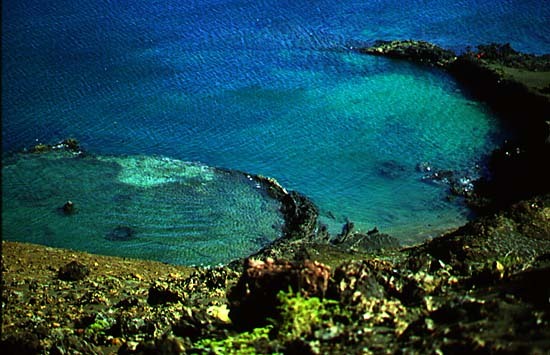 Even smaller craters form rings just at sea-level at the base of the main cone of Bartolomé; the red specks in the upper right of the photo are tourists at the boat landing. Interesting structures found on the flanks of some of the volcanoes are lava tubes. 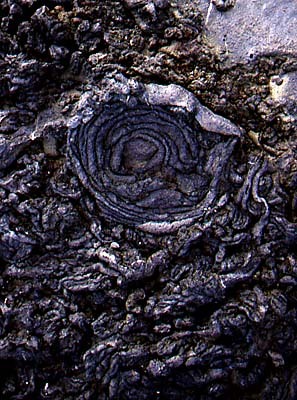 The tubes, or tunnels, are formed when the exterior of a lava flow cools enough to solidify over a still flowing, molten interior. 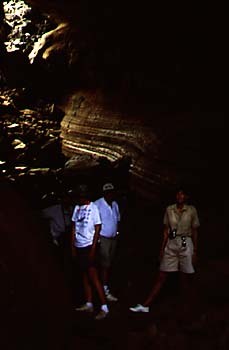 If the molten lava finds a way to flow out the downstream end, the tube may drain, leaving behind an open tunnel of lava rock. 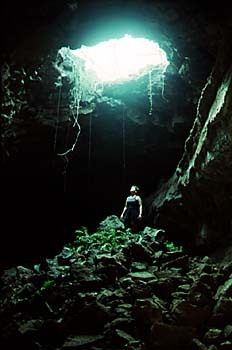 One such lava tube on Santa Cruz island is a commonly visited tourist site. The tube is entered through a portion of collapsed roof, and lit by a natural skylight formed by a smaller collapse. 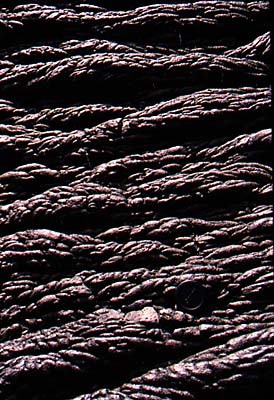 On the walls of the tube are horizontal lines parallel to the flow direction, perhaps marking receding lava levels. Lava tubes come in various sizes, not all big enough to walk in. 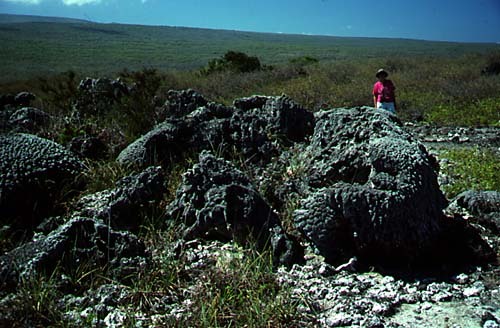 That the Galápagos are an area of tectonic activity is shown in ways other than young fault scarps and active volcanoes. 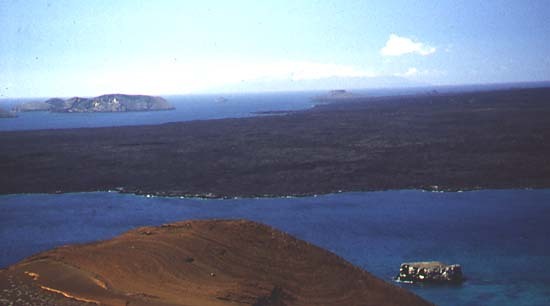 At Punta Espinoza on Fernandina Island, tectonic uplift has rendered a dock (background, right center) inaccessible to the tour boats it was built to serve. At Urbina Bay, on Isabela Island, giant coral heads lie bleached and dead after being suddenly uplifted out of the sea in 1954, apparently during an earthquake event. Strolling across the Sullivan Bay flow. 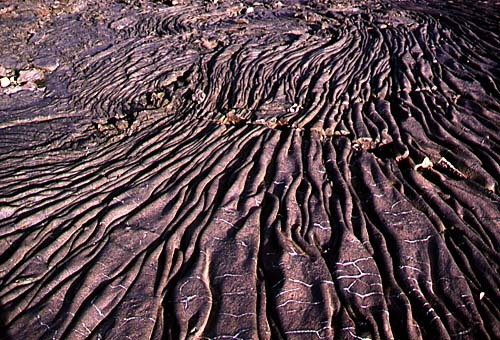 Looks like a wrinkled bedsheet; note white mineral in-filling in small tension fractures perpendicular to the compressional ripples. 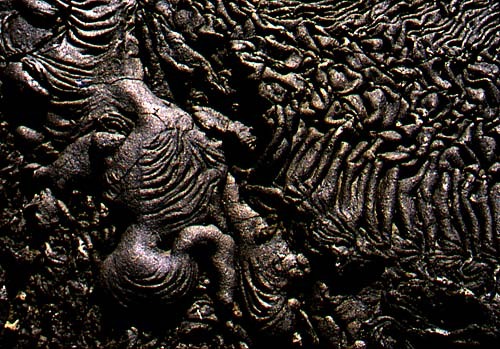 As it cooled the upper surface formed a "skin" that rippled and detached from the more fluid lava below. 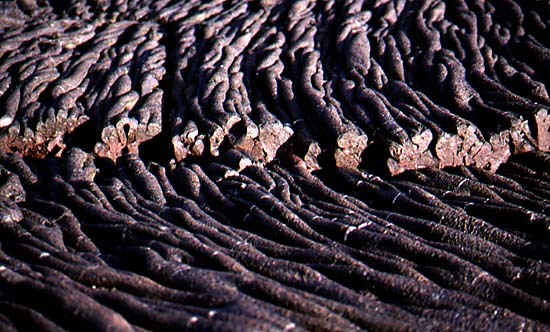 Close-up of a detached lava ripple. Rippled, then re-rippled in another direction. 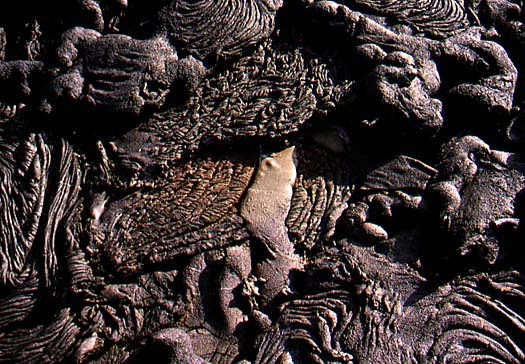 So why is pahoehoe commonly referred to as "ropy" basalt? Because it really looks "ropy" sometimes. 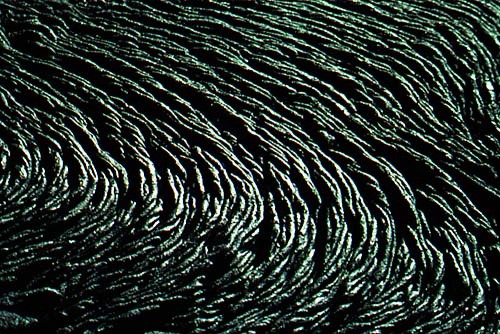 The ropy look develops when a second set of ripples is formed at a low angle to an earlier set, and the lines of the earlier set are preserved, forming the "lay" of the "ropes". Ripples, re-rippled, and re-rippled again. 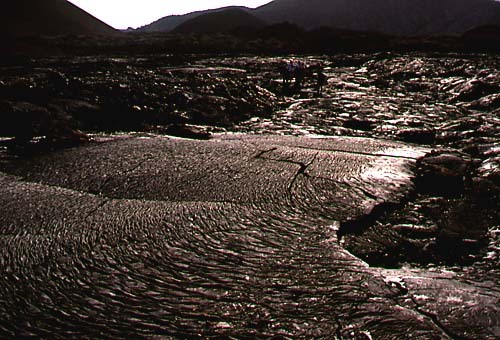 Flow movement may cause crusts of hardened lava to break into plates and dive back into the still-molten flow below. 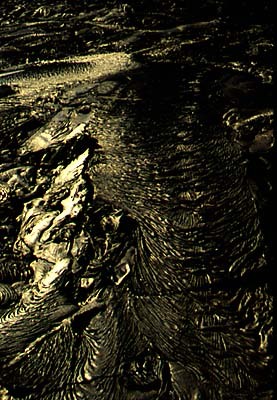 The surface is constantly being transformed as molten lava pours out to create a new smooth surface, gets rippled, and later broken up into plates to dive below. 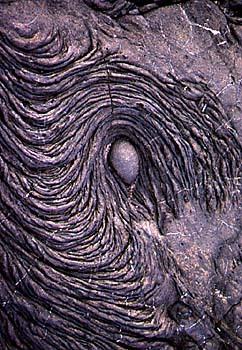 A single bubble rising through the lava ropes. Ripples wrapped around a rising bubble. A chain of broken bubbles. A cowpatty bomb or just another bubble burst? An "hornito" (Spanish, "little oven"), or chimney, formed where rising gas threw out spatters of lava. 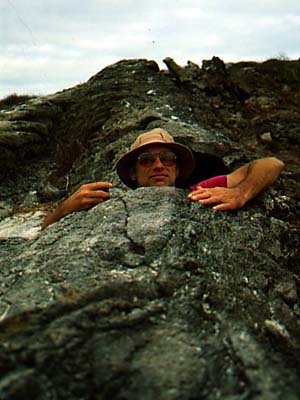 For a website with more in-depth information on the geology of the Galápagos Islands, see Cornell University's Dept. 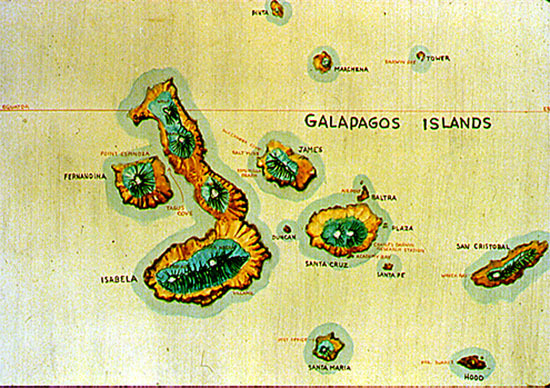 of Geological Sciences website on Galápagos Geology; just click here: www.geo.cornell.edu/geology/Galapagos.html. 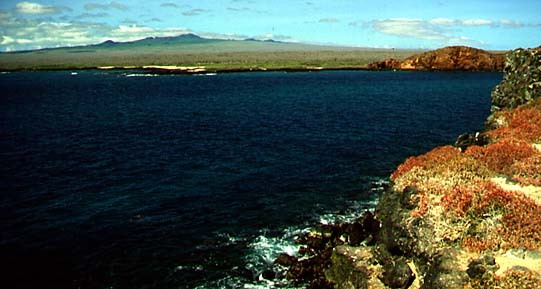 If you would like to see the wonders of the Galápagos Islands for yourself, CLICK HERE. Comments and enquiries can be mailed to: rfinch@tntech.edu. To see exotic trips and otehr travel services offered by Rutahsa Adventures, visit our homepage: Rutahsa Adventures. America Bulletin, v. 88, p. 1385-1403.